The MyPlate Icon is part of a larger communications initiative based on 2010 Dietary Guidelines for Americans to help consumers make better food choices. MyPlate is designed to remind Americans to eat healthfully and it illustrates the five food groups using a familiar mealtime visual, a place setting. MyPlate consists of 5 groups: Grains, Vegetable, Fruit, Dairy, and Protein. Click here for a lesson plan on breaking them down together to see what makes up each of these groups. Complete ONE application per household or ONE for EACH foster child. Use BLACK ink. If you are interested in joining the Food Service team, please see Employment Opportunities on the Human Resources page! 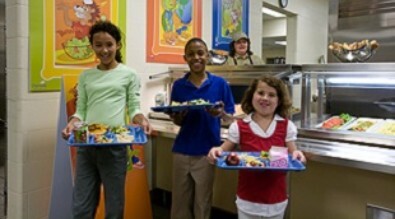 The way we access our school menus has changed in an exciting new way. Summit School District, in partnership, with Chartwells K-12, is now using Nutrislice to publish the school menus to a new interactive website and a free smartphone app! Now our school community can access our menus anywhere, anytime! • Access to nutrition information carb counts and calories with just a few clicks! Download the Nutrislice App from Google Play for Android or the App Store for iPhones! Access menus by clicking the link below! empleo o de cualquier programa o actividad realizada o financiada por el Departamento. Service (Servicio federal de transmisión) al (800) 877-8339 o (800) 845-6136 (en español).